The carving of the Westford Knight was uncovered in Massachusetts in the 1700’s, and is said to be the effigy of a 14th century knight, supposedly Sir James Gunn. Sir Gunn was a companion of Prince Henry Sinclair, whom some thought traveled to the New World in 1398. An examination of the sword and shield on the carving claimed it to be a rendering of the coat of arms of the Clann Gunn of Scotland. 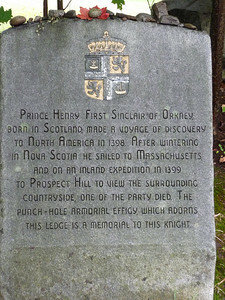 The Memorial reads; Prince Henry First Sinclair of Orkney Born in Scotland made a voyage of discovery to North America in 1398. After wintering in Nova Scotia he sailed to Massachusetts and on an inland Expedition in 1299 to Prospect Hill to view the surrounding countryside, one of the party died. The punch-hole armorial effigy which adorns this ledge is a memorial to this night. Professor David Schafer of the Peabody Museum of Archaeology and Ethnology at Harvard examined the effigy and concluded that only the sword section of the carving is definitely a medieval punch carved drawing, and that the rest was just glacial scratches. In medieval Europe drawings were first rendered on paper, and then with sharp tool, punched through to mark the stone beneath. This still doesn’t answer how a medieval sword came to be carved along a well traveled Indian path in Westford, Massachusetts in 1398. There was also another medieval carving found in Westford, which can be seen at the Westford Museum. It is a stone covered with similar markings to the Westford Knight, depicting a 14th century ship and trail markings, consistent with the medieval style. 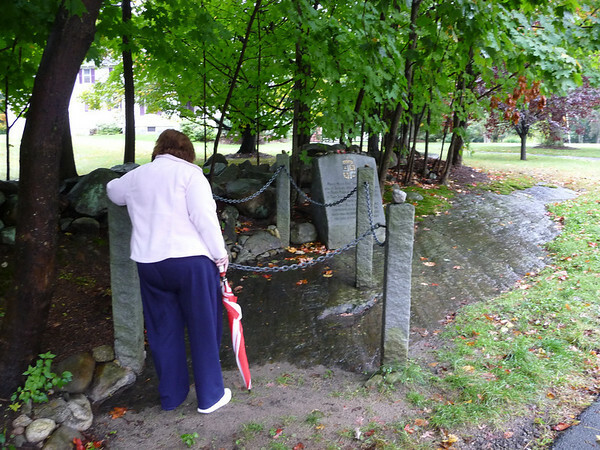 Some think that this stone depicts the “knorr” which brought Sinclair and his company to the New World, one hundred years before the voyage of Columbus. The markings also match runes found in Newfoundland, Newport, Rhode Island and other places along our New England coastline. David Brody, a Westford resident, has just published his fourth novel, “Cabal of the Westford Knight” and if you Google his name you can find several book signing dates in our local area. He claims to have original material, not similar to the “Da Vinci” book or other novels. Dan Brown’s newest book, “The Lost Symbol” mentions the Sinclair family, and the Rossyln Chapel which featured in the last scene of the “Da Vinci Code” movie was founded by William Sinclair, Prince Henry Sinclair’s ancestor. No similarity, ‘eh? Just to make things more interesting, one of the founding New Hampshire families in the seacoast area was the Sinclair or Sinkler family, descendants of the same St. Clair family of Europe. More mysterious connections? So, with our imaginations piqued, while we photographed the Westford Knight, in a light rain, on a Sunday afternoon, we were not alone. Several other carloads of the curious were also there. The photographs do not reveal much, and I’m sure that on a sunny day, the markings would be even less visible. I was amused by the wording on an accompanying stone, which stated “Prince Henry, First Sinclair of Orkney, born in Scotland, made a voyage of discovery to North America in 1398.” Not “supposedly made a voyage” or “is thought to have made a voyage.” I think the truth lies somewhere in between the inscription and the History Channel. You can see for yourself whether or not you think this is truth or myth. Take Rt. 3 out of Nashua and over the Massachusetts border to exit 33 for Groton Road in Westford. Go left to Depot Road, and turn left again. In about two miles park at the Abbot Elementary School on your left and walk further down Depot road, past two houses to the stone marker on the left side of Depot Road. Can you solve the mystery, just like Robert Langdon? Further information on the Westford Knight is available at the Westford Museum and at the J. V. Fletcher Library in Westford. For more information and directions visit the Westford Museum Website. Browse this map for detailed directions.